We also take the time to remove electrical plates, light fixtures, and	other hiding places that are less obvious and may be easily overlooked. What do they look like and how would I know if I have bed bugs? Bed bugs are generally 1/8 inch – 1/4 inch in length. They are reddish	brown with an oval shaped body and small head. These insects feed on warm	blooded animals – normally the blood of sleeping people. 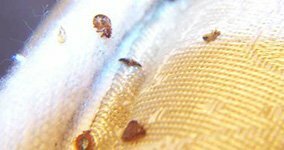 One of	the first signs of having bed bugs is discovering that you or a family	member has been bitten. Their bites leave small red marks which will turn	to itchy welts on the skin. Another way at detecting the presence of bed	bugs is from the bloodstain on your sheets or in or near the seams of	your mattress. Why is it important to call Eastern just as soon as you detect the presence	of bed bugs? Bed bugs reproduce rapidly. A pregnant female can lay up to 10 eggs at	a time that will hatch in seven to ten days. The baby bugs need to start	feeding immediately on the blood of humans. It only takes these bed bugs	8 weeks to become adults and start reproducing. So time is of the essence	before the population of bed bugs gets out of control. How do bed bugs get into our space? We can come in contact with bed bugs anywhere — at work, at stores,	in a hotel, and when we travel. 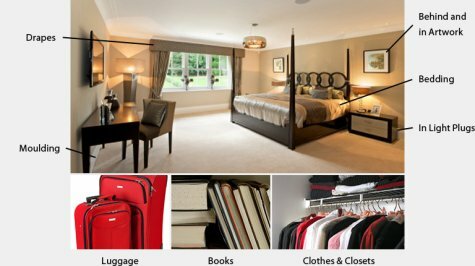 Bugs can hide in suitcases when we travel,	or in briefcases or purses at work, they can also migrate from adjoining	apartments, retail stores or other spaces. They can hide in packages that	get delivered and infest your home in a host of other ways. How difficult is it to detect the presence of bed bugs? It all depends. There are two ways to detect bed bugs – by visual	inspection and by smell. Even the most experienced exterminators can only	find them about 35% of the time. Highly-trained dogs can find the bugs	95% of the time. So an experienced exterminator knows where to look and	is trained to work with a certified bed bug detection dog who can smell	the bugs that are not easily visible. For example, dogs can detect bugs	in places that are extremely difficult to visually inspect – in	all of the books in bookshelves, in clothing, shoes, closets, furniture,	electronics, etc. At the same time, our exterminators will check behind	light plug covers, behind artwork, in light fixtures. etc. A dog can also	quickly detect if the bugs have spread into other rooms. Our unique approach to detection, treatment and prevention makes sense. Not only do we use highly-trained and certified bed bug detection dogs,	we always send two experienced exterminators to each appointment. This	two-pronged approach ensures an unsurpassed level of accuracy, efficiency,	and results you can trust. While many firms rely on either a chemical or a freezing process, we use	both because we know how important it is to do it right. This provides	you with not just an initial kill but a safe and long lasting protection	for you and your family. It you have ever had bed bugs you know that you don’t want them to	come back. That’s why we take the time to educate you on how to	reduce the risk of ever getting bed bugs again, and we carry specialized	products that provide ongoing protection. We have the same commitment to satisfaction for both residential and commercial clients. Whether we are exterminating bed bugs from: an apartment, house, hotel,	department store, restaurant or storage/warehouse space, we have the experience,	expertise and reputation for excellence you can trust. At Eastern we take the time to educate you so you are better prepared to	help prevent future infestations. We also carry the mattress covers that	we recommend for additional protection and peace-of-mind after the extermination	process. It is our policy to always keep your problem confidential. 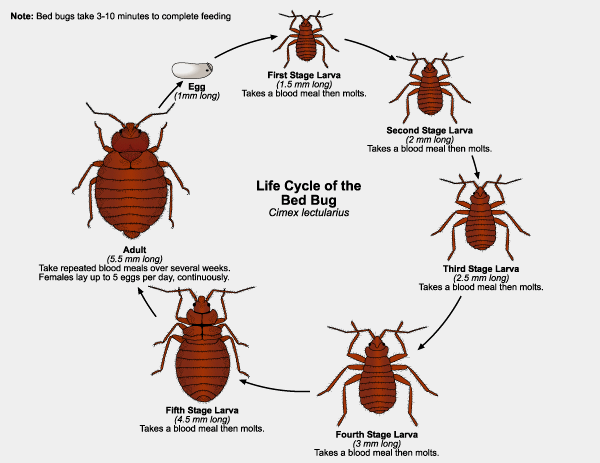 We understand the implications of having a bed bug problem. With Eastern,	you can relax because we always keep your problem confidential. We also	adjust our schedule to solve your problem quickly and effectively and	with as little disruption to your business as possible. The Cryonite® method uses the cooling properties of common CO2 (carbon	dioxide) to kill pests. Liquid CO2 is transformed into exceptionally cold	dry-ice snow, and freezes the pests to death. CO2 is not poisonous and	leaves no residues. The method is completely dry. It is also physical,	i.e. non-chemical, therefore there is no risk of pesticide resistance. Pure CO2 presents no risk of contamination, even in sensitive industries. It is recycled from industrial processes. CRYONITE therefore does not	add CO2 to the atmosphere (carbon neutral). The CO2 is in a liquid form in the tube and will come out frozen (snow)	from the nozzle. About half of the CO2 will become cold gas, blowing the	snow forward into the pests hiding places. The CO2 snow made from CRYONITE is a mixture of particles with different	sizes and speeds. This mix forms a snow with good freezing qualities and	has been tested to give the optimal result-against pests. When the CO2 snow hits surfaces at normal temperatures it evaporates (sublimates)	and becomes CO2 gas. During this process energy is required and this heat	energy is extracted from the immediate surroundings. If insects are part	of the immediate surroundings, the energy is taken from them and extreme	cooling results, the water in their cells crystallizes to ice, killing	the insects. Materials will only be chilled on the surface. Most materials	have the ability to transport energy from their larger mass, which results	in relatively small drops in temperature here. When the pest is deep frozen,	it has to stay frozen for a short while. CRYONITE’S particles are	optimized for reaching the pests, and clinging to them. Note: This is why Nitrogen is not as effective despite colder temperatures	(-198C / -320F); because as it goes from liquid to gas it floats on a	layer of gas thus forming insulating barrier, it takes almost no energy	from the surface. CRYONITE’s particles hit both pests and surfaces,	touching them directly.